The surgical correction of eyelids including the treatment of wrinkles, folds and eye bags is technically referred as Blepharoplasty. 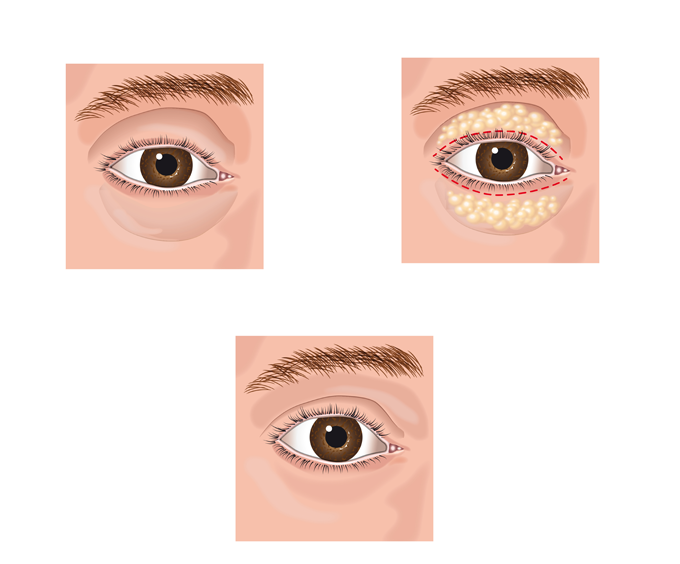 The process of cosmetic eye bag removal and eyelid surgery is recommended for you if your eyelids are noted with abnormalities that are responsible for odd and unimpressive looks of your eyes because of which your facial beauty is also affected. Blepharoplasty is a cosmetic procedure which has the ability to renew your lost identity and beauty proposition. The common abnormalities noted around your eyes, especially on the eyelids are the presence of eye bags along with wrinkles. Eye bag formation or impression on the lower eyelids is very common but the possibility of it on the upper eyelids can’t be ignored either. The provisions of eyelid surgery are pretty much the same for both lower and upper eyelids, the procedure involves the cosmetic corrective and reconstructive measures. The provisions of skin wrinkle treatments with wrinkle smoothers and dermal fillers can become complementary to the advantages and benefits of eyelid surgery as the final phase of the procedure is all about cosmetic restoration of the skin to make it appear impressive and even softer. Even though the outcome of Blepharoplasty is restricted to the eyelids region, its impact is always clearly felt over the facial beauty and appealing impression. Our Sheffield Clinic for Cosmetic Care has special focus and provisions for facial enhancement and procedures like eyelid correction or eye bag removal are offered with comprehensive care. The modern day idea of beauty and personality is defined by cosmetic standards with the advancements and subsequent provisions of cosmetology have been maturing towards redefining therapies and solutions to enhance the overall physical appearance of the body. This also makes every aspect of beauty enhancement to become more significant and from this perspective a cosmetic therapy like eye bag removal holds a lot of importance to improve the facial beauty that compliments your body type. Men and women have been recognizing the need to stay fit from all the angles of healthcare among which emotional health driven by cosmetic solutions is finding a great deal of acceptance. If there are corrective measures available, it is good to opt for them instead of letting your appearance to degenerate with time. Blepharoplatsy would be a naturally preferred option when it comes to enhancing the beauty and appearance of eyelids. The surgical provisions of cosmetic therapies are very beneficial and the best part about them is the ease of predictability and the possibility to forecast the therapy outcomes. The advanced facilities and equipments we have at our Sheffield Clinic would make the whole experience of undergoing a cosmetic procedure a memorable one. Our Cosmetic Clinic at Sheffield has the reputation and identify built on excellent processes that lead to offering quality treatment. Overall, the comprehensive care we provide is reflected through many successful outcomes. When we recommend Blepharoplasty for the sake of your eyelid correction or eye bag removal surgery, we always take a methodical approach that involves the phases of consultation, treatment planning and care after the therapy. Since the eyelids are very proximately located to your eyes, it is important to ensure that there is no impact of the therapy on your eyes. It is also important to determine your candidature by checking your eyesight and other fitness parameters. The procedure is performed by the cosmetic surgery specialists and the application of anesthesia is essential considering the nature of the procedure being a surgical process. Under the normal situation, the procedure of surgical correction and restoration of the eyelids is pretty safe and there is a lot of dependency on the expertise of your operating surgeon. The duration required for the process is around ninety minutes as per the standard estimates. It is very much targeted in its nature and the core of the procedure is about removing the excessively formed skin around the eyelids, causing the impression of eye bags. Once the removal of the skin is done, the crucial part of cosmetic restoration of the operated area will be implemented. At the end of it all, you will be experiencing smoother and softer skin without wrinkles or folds. It might take around a week’s time for the benefits of the procedure to become evident. It is good for you to take rest for around ten days before you want to resume your routine activities. The surgical process of Blepharoplasty is not very complex and there is absolutely no reason for considerations pertaining to the safety of the procedure. As long as the process is implemented at a reputed cosmetic clinic, there shouldn’t be reasons for panic and worry. But, you need to be prepared to handle the procedure related complications or immediate side effects, if any. All the precautions and safety measures will be considered by our experts from Sheffield Clinic and the possible side effects are managed well. With backing of the rich experience of handing post therapy complications, we always recommend standard norms of care and precautions. Often there are considerations about the aging process and how aging is responsible for growing abnormalities. The truth is that if you are concerned about cosmetic degeneration of your skin and overall beauty, you may have to undergo the corrective therapies at the earliest without waiting for the situation to worsen further. The chances of revival and long term substance of your facial beauty and eyelids would be more if you are seeking early consultation and opting for the right therapy at the right time. Nu Cosmetic Clinic is a premium entity in cosmetology and we have our reputed centers for cosmetic care all across the UK in major cities. You don’t have to be worried about issues like relocation and future prospects of follow up in case if you move out of Sheffield.